Fall home decor: entryway ornamentation using a mixture of natural and silk materials. Although we are blessed with great weather year-round, those of us on the West Coast do not enjoy the dramatic seasonal changes that occur elsewhere in the country. In the Inland Empire, we are often consumed by the heat of an Indian Summer all the way through the fall season and then suddenly the calendar turns to the arrival of Christmas! I enjoy draping my living environment with seasonal fall home decor; however, since summer time seems to last straight through the fall in these parts, autumn has occasionally sneaked right past me. In years past, when I missed changing accessories from summer to fall, enthusiasm and commitment to my winter holiday decorating that comes afterward became very difficult to generate. I quickly learned that despite the fact that the temperature is hovering in the mid-90s and we’re still walking around in shorts and flip-flops, I need to participate in the fall seasonal change as it provides the foundation for decorating for the Holiday season. Here are some suggestions for areas in your home that are great for applying some fall home decor. I usually do a detailed cleaning of my front entry in August while the weather is hot and I have the spare time. The time spent up-front on the prep work will allow more time for decorating once Autumn officially rolls around. There’s a pumpkin farm near my house that sells dried corn stalks. It’s out in the country a ways and it’s a nice drive. 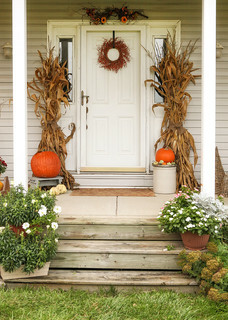 I’ll head out there on a Sunday early in the season and pick up a load of dried corn stalks and use them to decorate the entry of my home. Bundling the stalks upright in a corner provides a nice foundation for your entry décor. Light poles are excellent for wrapping stalks around. Bundling the stalks standing upright will allow you to display other seasonally appropriate goodies such as gourds, pumpkins and fall foliage throughout the remainder of the season, continually adding material as time or occasion dictates. If your area lacks for natural fall foliage, artificial foliage can be used in your fall home decor to provide color early in the season. Use high-quality silk products. The higher quality will last much longer and provide a more realistic representation than cheaper artificial foliage. I also like to string together citrus fruit using floral paddle wire to make a long “rope” of fruit. These can then be added to a “harvest wreath” that will last for several months, providing vibrant fall colors to your outside décor. During my August clean-up routine, I always make sure my front door has a fresh coat of paint so my holiday decorating has an attractive backdrop. 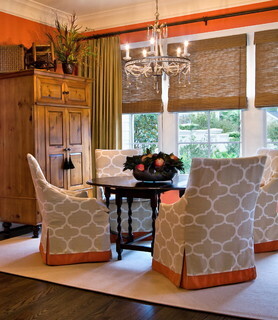 Using slip covers on your dining room chairs are an easy way to create a festive seasonal change. I coordinate the slip covers with some additional throw covers for the furniture and I have a new look for a low cost and for little effort. As a designer, I often assist my clients in coordinating several fabrics that can be incorporated into table cloths, table runners and throw pillows. I’ll help them plan out their whole “year in accessories” and incorporate elements that can be tastefully mixed and matched as the seasons require. Bring elements of the outside décor to the inside to tie things together. For instance, I’ll use the citrus fruit garnish that I added to the outside wreath as an embellishment to my table décor. This adds a unifying aesthetic to my design and creates a familiar flow. A fall table is very easy to create from your existing home accessories. Look around your home interesting knick-knacks. Gather your odd candle collection or that antique silver tea pot that’s sitting in your cupboard. Intersperse these items among your pumpkins, gourds and Indian corn. Fall home decor is casual, rustic and earthy so explore your own talents and you can create a great centerpiece for your family for very little cost. The corners of windows are great places to add a bit of festive flare. I am constantly on the lookout for seasonally appropriate bouquets or baubles to place in them. For instance, I found some delightful rhinestone “berries” at a craft store a while back. Using my florist’s wire, I like to wrap them into small bouquets and add them to the corners of my window treatments. This adds a point of interest and a reflective element to catch the sun’s glimmer. Dried flowers also work well in this area. What other bits of “flare” can you think of to adorn your windows with? Be creative! Seasonal decorating is a yearly process. Some years there is more time to dedicate to this than other years but good decision making is always critical to establishing a flexible foundation. It takes time to develop your style and presentation. Choose wisely and try not to be impulsive. Enjoy the journey of gathering ideas that will inspire your creativity. Keep a notebook! I have developed a notebook into which I collect ideas, and affix pictures that give me inspiration and direction. I review and edit my idea notebook frequently, for, as the styles and trends change, so do my tastes. For this reason, it’s good to reassess your collection to eliminate worn or outdated accessories and make room for new and current ones. I also take inventory of my seasonal accessories and create a wish list that identifies missing accessories I would like to shop for. I keep my inventory and wish list in the same notebook. I have found that the inventory list and the wish list have kept me on track for years and have prevented me from being too impulsive. Always take the time to clean your accessories before you put them away for storage. This makes the set up for next year a lot easier and faster. Wrap your items with tissue so they remain clean. When you store them away for next year, make sure you label the boxes! Yes, Fall will return year after year and you want to develop a well planned, easily executed process you can use to Bring Fall Home. Develop a budget so you can enjoy adding those special items to your collection that will take your decore to the next level. Now, if all this seems overwhelming and you are just too burdened with time commitments, develop a long term relationship with an Interior Designer who can carry the ball for you. A good designer will learn your own inventory and will know how to shop off-season for next year’s wish-list items. A good interior designer travels the design trade show circuit and sees the most current products on display. A good design professional will get to know your home and will avoid unnecessary purchases. She will have the creative know-how to bring your design forth in a timely and beautiful manner.